“Duty to God” is at the heart of the Scouting movement. Religious emblems reinforce this spiritual component and promote many of the values found in the Scouting program. The purpose of this “Duty to God Promotion Patch” is to encourage youth and adults to learn about and promote the religious emblems programs. 1. Attend or coordinate a presentation or information seminar on religious emblems (sample resources and suggestions are available at www.praypub.org ). ü Adults can commit to having 50% of families participate in the religious emblems programs, nominating a worthy adult to be recognized with an adult religious award, serving as counselor in their local congregation, etc. ü Youth can commit to earning the religious emblem of their faith at an appropriate time, making a presentation on religious emblems to another unit, helping younger Scouts earn their religious emblem, etc. ü The Duty to God Promotion Patch is a four-segment puzzle patch. ü Only one segment will be offered in any given year. ü Participants are encouraged to earn all four segments over a four-year span. ü Visit www.praypub.org to find out which patch is currently available. ü Patches may be pre-ordered for distribution at the presentation/ information seminar. 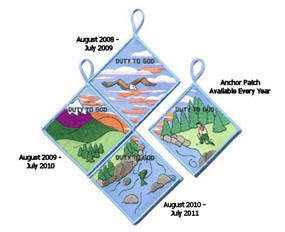 The Duty to God Promotion DVD contains the resources to make a presentation on the religious emblems programs. These resources include the video “Promoting Duty to God (Religious Emblems),” Duty to God brochure/chart listing all religious emblems (No. 05-879), scripts (for presentations to Cub Scouts, Boy Scouts, and Venturers), and Parent Handout. Call and talk to the "Religious Emblems People" today! ü To further involve commissioners in providing support to units in their delivery of a quality program experience for all youth in Scouting. ü To provide councils an opportunity to recognize commissioners for their tenured service, their involvement in learning more about delivery of quality Scouting, and their involvement in support of others. 1. Maintain registration in any capacity as a Commissioner during the entire training program listed below. 3. Complete commissioner basic training. 1. Completion of bachelor’s degree. 3. Current registration as a commissioner. 1. Completion of master’s degree. 2. Have been awarded the Commissioner’s Key. Completion of a thesis or project on any topic of value to Scouting in the local council. The topic and final paper or project must be approved by the council commissioner, or assigned assistant council commissioner, or the dean of the doctorate program and the staff advisor for commissioner service. 1. Serve on the College of Commissioner Science faculty (instructor or support staff) or work with training support for commissioners for at least one year. 2. Recruit at least three new commissioners at any level. Anyone who earned their doctorate based on the qualifications listed above will not have to repeat what they have already completed, even if it was prior to 10 years ago. Just check with your local council on the procedure to follow.